No doubt you’ve heard stories: huge international gaming tournaments with million-dollar prize pots; streamers on­line making thousands of dollars by playing popular titles like Hearthstone or Fortnite; and individual players with grassroots origins playing at local tour­naments, working their way up to the top rankings of their game of choice. As the video game industry continues to prosper in this age of technology, fans of gaming have taken to great lengths to get more entertainment from video games outside of just the game itself. Multiplayer has been an aspect of video games since the 70s with Pong, but after the Internet integrated with video games via online multiplayer, local multiplayer has been on a decline. However, a large genre of gaming has been keeping that style alive and well: competitive games. Specifically, the fighting game genre. While fighting games aren’t the only local multiplayer games in the scene, first-person shooters and party games are also popular, there’s no denying how large the fighting game community, or FGC, as dubbed by fans and players alike, is in competitive gaming. Brought into the greater public consciousness by titles like Street Fighter 2, and further popu­larized by games like Marvel vs. Capcom and Super Smash Bros. Melee, fighting games have arguably the largest presence in the competitive gaming scene. Just this last August, the largest fight­ing game tournament event of the year, EVO 2018, had a prize pool totaling up to over $100,000 across its eight main events, and peaked Twitch stream view­ers to 253,000 during its Dragon Ball FighterZ tournament. Top FGC players can make an honest and lucrative living playing competitive games by winning and/or ranking highly in major tourna­ments in the same vein as athletes com­peting in their sports. As this proverbial pie looks so appeal­ing to fighting game fans, it’s no surprise that every year more players are trying to get their thumbs in it. But no top play­er got to nationals in a week, and it takes a lot of practice and discipline to reach the status and rankings top players have. Everyone gets their start somewhere, and the University of Central Florida’s Super Smash Bros. club “Smash Knights” of­fers a starting point for those looking to break into the scene or to just have some casual fun with fellow players. Smash Knights, organized by UCF junior Lake Spangler, hosts free weekly tournaments every Sunday at the cam­pus’ Libra Community Center for anyone who enjoys playing Super Smash Bros., specifically the most recent entry on the Nintendo Wii U. 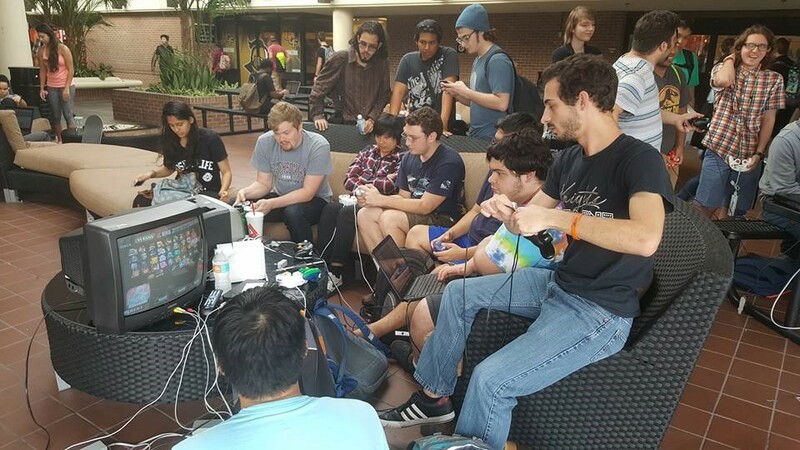 Along with its Sunday weeklies, mem­bers of the club meet up at UCF’s breeze­way area whenever they have the time to play friendlies and hang out. As eSports grows in popularity by the year, competitive gaming is getting more recognition from schools such as the Uni­versity of Central Florida, who recently recognized the Gaming Knights organi­zation, unrelated to Smash Knights, as an official sports team for the university; and the Seminole State Lake Mary cam­pus’s student center, which was finished at the beginning of this year, features a game room with four TVs and consoles where students come to play fighters like Dragon Ball FighterZ and shooters like Call of Duty. “I feel like competitive gaming is more inclusive and open than competitive sports,” said Spangler. Many members of Smash Knights also attend competitive local tournaments with small prize pools, such as the “CFL Smackdown Smash 4” weekly tourna­ments every Tuesday held at the Campus Cards & Games store, by the eSports or­ganization Polarity. Between tournament sets streamed on Twitch, to side events to money matches; members of the central Florida Smash community come together often with the broad goal of socializing and having fun over a mutual love for a video game. With a new installment in the series- Super Smash Bros. Ultimate- hitting the shelves in December, many Smash play­ers, including Spangler, expect the com­munity to explode in popularity once again. The growing presence of competitive games, and the communities they cultivate, spread further influence throughout the mainstream and the niche alike. Come December, the FGC will once more experience a wave of new talent, new communities, and new friends forged from frantic, frenetic fighters. Games don’t just connect people online to play across the world; they connect people right at home.